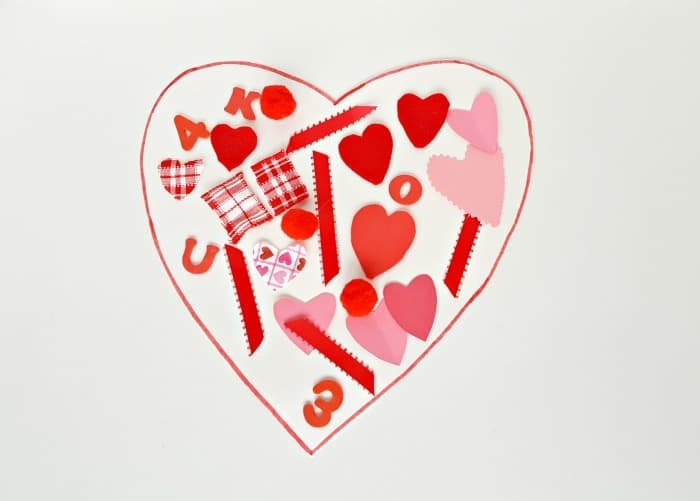 This Valentine’s Day Collage Craft for Toddlers is a great open-ended art activity. 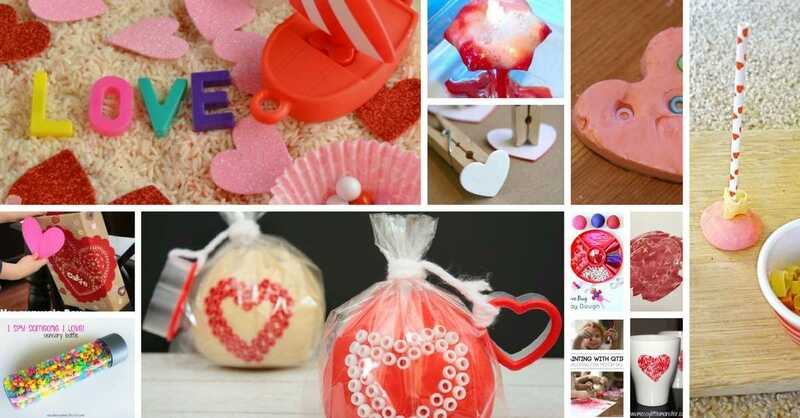 Our Toddler Valentine’s Day activities are always popular and this one is no exception! A large heart shaped cut out with lots of colorful decorations can easily provide a fun Valentine’s Day Invitation to create. Seasonal holidays like Valentine’s Day are perfect opportunities to engage kids in art activities. Kids love making decorations and homemade gifts. And the more they practice fine motor skills such as cutting and gluing, the better prepared they will be for beginning writing skills. 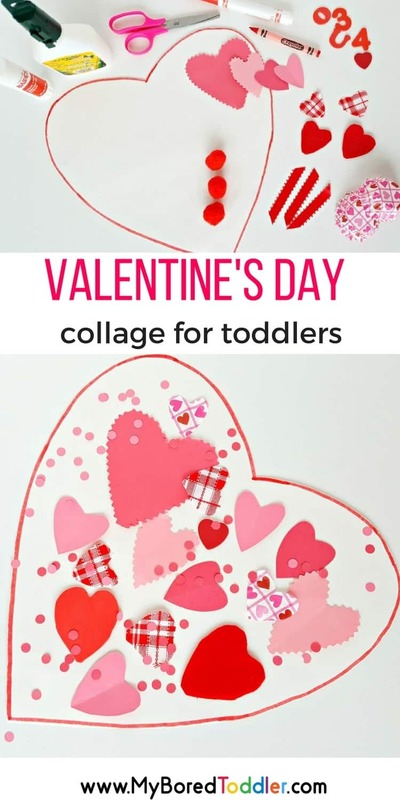 This Valentine’s Day collage craft is perfect for toddlers and older children can join in too. The different shapes and textures in this art activity also provide interesting sensory play for your toddler. This list is just a sample to give you some ideas on how to prepare the activity. It can be done with any materials you have on hand, especially things that are red and pink! Start with simple craft supplies such as white glue or glue sticks, construction paper and scissors. Cut heart shapes from wrapping paper, craft foam or felt. 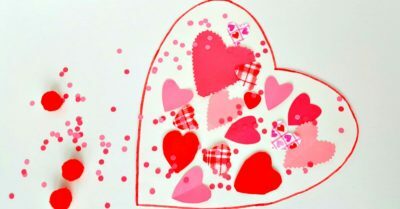 Recycle used Valentine cards, or cut out shapes and pictures from magazines. 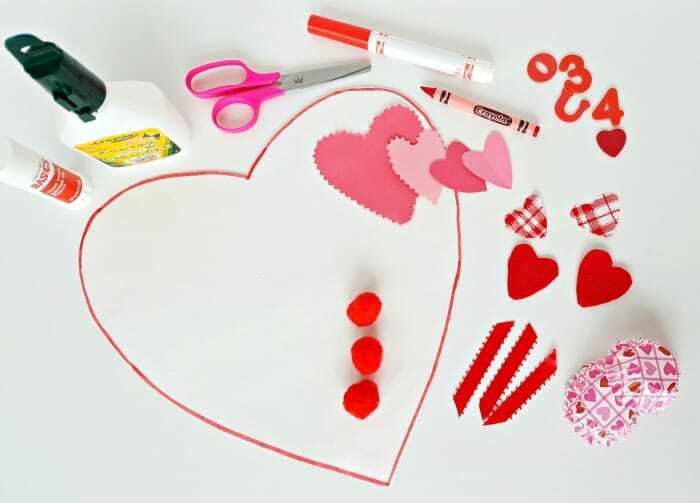 Encourage your toddler to choose craft materials one at a time to glue to the heart cut-out. Talk about the pictures and shapes as they are added to the collage. Allow time to rearrange pictures, overlap textures and shapes, and add some artwork with crayons or markers. Make confetti with a hole punch and some red and pink construction paper. Spread glue on the picture with a glue stick. Your toddler will love sprinkling confetti over the picture. 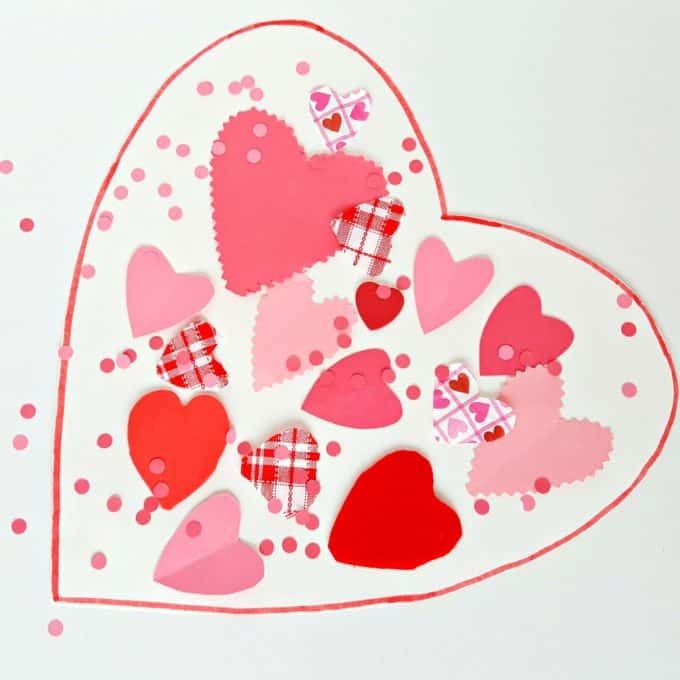 Show your child how to pick up the heart cut-out and give it a little shake to remove loose confetti! Process art (or open-ended) activities are especially beneficial for kids. Child-led activities promote independent thinking and decision making. Child-led activities engage developmental skills such as fine motor and cognitive while designing, cutting, rearranging and gluing. As adults, it’s important for us to guide without intervening too much. Your toddler’s participation and enjoyment are more important than the product. Watch your toddler take the lead in this fun Valentine activity and see what results! Make sure you share photos of your Valentine’s Day collage in our Facebook Group or over on Instagram – Use #MyBoredToddler so we can see! You can also sign up to our weekly newsletter or follow us on Facebook or Pinterest for more great toddler activities and ideas. Find all of our Valentine’s Day Activities HERE.